Arcade Video Game published 37 years ago by Sigma Enterprises, Inc.
Waga Seishun no Arcadia © 1982 Sigma Enterprises. The title of this game translates from Japanese as 'Arcadia of My Youth'. This game is known outside Japan as "New York New York". Waga Seishun no Arcadia is based on the animated movie of the same name. 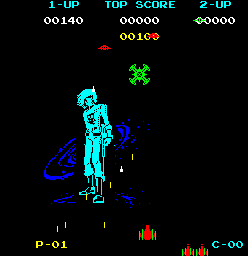 The guy standing in the background of this game is Space Pirate Captain Harlock, the protagonist of the movie. Arcadia is the name of his ship. Starting before this movie and into the present day, Harlock is featured in a number of comic books, TV series and movies. * In the background of 'NY, NY' is the Statue of Liberty, surrounded by blue buildings. * In 'Arcadia', the Statue has been replaced by Captain Harlock (who is still the same color as the Statue of Liberty for some reason) and there is a blue nebula instead of blue buildings. * Also, the words 'New York' have been replaced by 'Arcadia' in the demo. * Besides the picture of Harlock in the background, nothing else in the 'Arcadia' game really has any relationship with the movie at all. * 'NY, NY' came first and was then slightly modified to cash in on the 'Arcadia' movie. * There are also no additional copyright notices, as there would normally be in a game based on a movie (So perhaps it wasn't even officially licensed). * Another odd thing is that in Arcadia it really doesn't make a lot of sense to have a giant cyan Capt. Harlock floating around in space in the background. * Whereas in NY, NY it actually makes sense for the Statue of Liberty to be in the background.